Drum Your Dream is about providing an uplifting, attention-getting, drumming experience for everyone to enjoy, regardless of their musical abilities or age. We provide quality interactive rhythm based events for multi-generation groups in Communities, Education, Health and Corporate workplace environments. Through hands on music making and interactive performances, we seek to enhance teamwork, cultural appreciation, community spirit and most of all; we “Create Unity in the Community with Drum Circles.™” We do this through the use of a Fun Filled Facilitated Drumming experience. Each participant gets to share their own special unique beat with the group which connects everyone together. And in doing so, we break the ice for first time guests to become new friends with one another in the community and work environment. Chanel 8 News in Richmond Virginia. 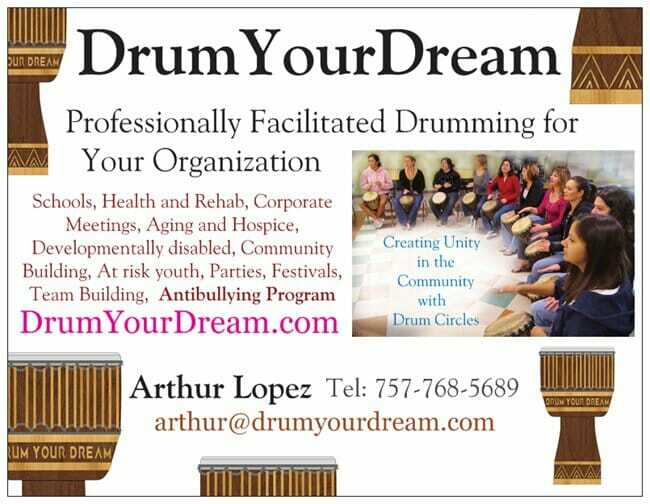 Story about Arthur Lopez from DrumYourDream.com Drum Circle. This is an Annual World Wide event for Peace and Global Unity. The idea is to use drums, as they have been doing so for thousands of years, to gather the community and plant the seeds of peace in the hearts and minds of all those who attend. And by doing so, we hope that it may flourish and continue, long after the event is over, to propagate and inspire others to foster peace, in their own unique way. Our intent is to inspire people, from all over the world, who have hope for humanity, are willing to work towards peace and inspire others to do the same. Arthur Lopez founder of DrumYourDream.com started in 2010 and evolved from the work that began in the Virginia World Rhythms Drum Circle, a community based organization that formed Drum Circles events all over the Hampton Roads/ Tidewater area of Virginia.